The Unibody and pearl plating Germany IF design winner products offer you a solid and reliable touch and a brass layer makes sure the working temperature of this car charger will never exceed 115℉. Professional Multi-protection leaves you no worries: Over-voltage protection, Over-temperature protection, Over-current protection, Anti-static protection, Surge protection. This item can charge iPhone series, including iPhone 4, iPhone4s, iPhone 5, iPhone 5C,iPhone 5S, iPhone 6, iPhone 6 plus, iPhone6S, iPhone 6splus, iPhone 7, iPhone 7plus, iPhone8. Also, the charger can work with HTC, Nexus, LG and most Android cell phone. Our Chip can identify your device automatically and provide the proper current to your device. BULL/GN: The car charger and cable are designed by Bull Group that consists of hundreds of designers and engineers. It is famous for excellent quality for 20 yrs! Blazing Charge Times-Boasting 2.4A current capacity in one port and 3.6A total, get safe, lightning fast battery charging times for iPhones, Samsung Galaxy, and android mobile devices. Five Safety Protection-overvoltage protection, overcurrent protection, over temperature protection, anti-static protection, anti-surge protection, Five protection functions provide full protection for your charging equipment. Award Winning Design -The 2017 iF German Design Award winner, our car charger offers a fashionable design and superior charging speeds, making it perfect for daily car travel. 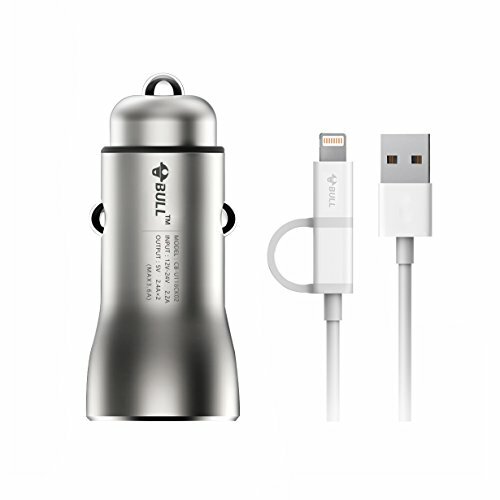 Best Car Charger Partner-This package contains 2 in 1 Apple Lightning and Micro USB Cable and two-port car charger,You don't worry about without charging line on the car.The car charger with dual USB ports can charge both devices at the same time, but the 2 in 1 cable can't charge iphone and Android at same time. If you have any questions about this product by Bull, contact us by completing and submitting the form below. If you are looking for a specif part number, please include it with your message.